Brachiosaurus: uglier than you think (we’re sorry, but it’s true). UPDATE: Fig. 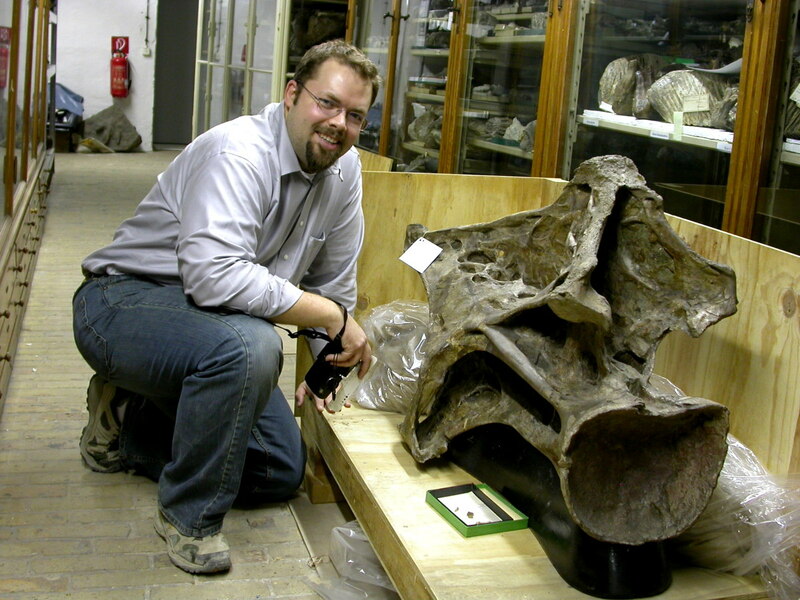 1 from Witmer (2001) showing hypothesized position of the fleshy nostrils in Brachiosaurus. How awesome was our trip to Germany? I’ll tell you: it was easily the best conference AND the best research trip I’ve ever been on. 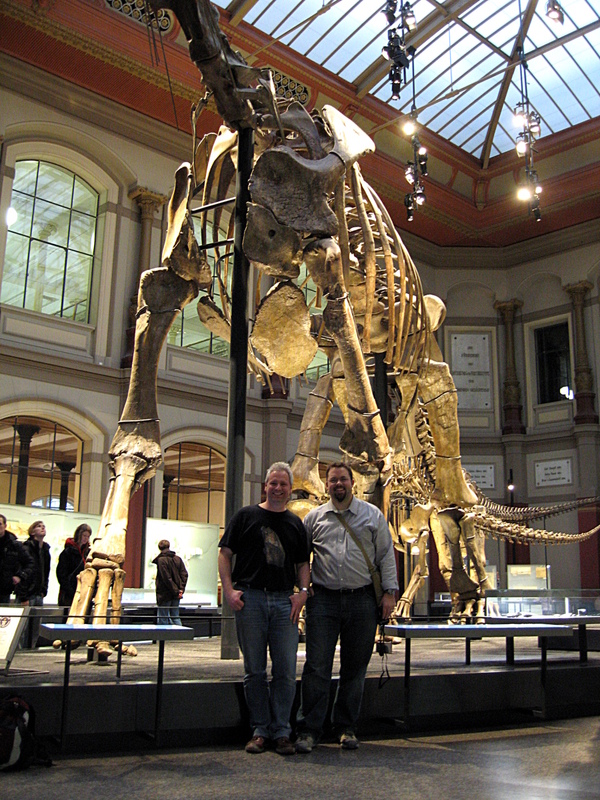 We started out with three solid days of sauropod talks at the University of Bonn. I’ve been going to SVP for ten years, and usually I’m lucky if there are three or four sauropod talks at the whole meeting, plus maybe half a dozen posters. There was so much going on in Bonn that after the first day, there were always two sets of talks running concurrently. Talk about your dilemmas! 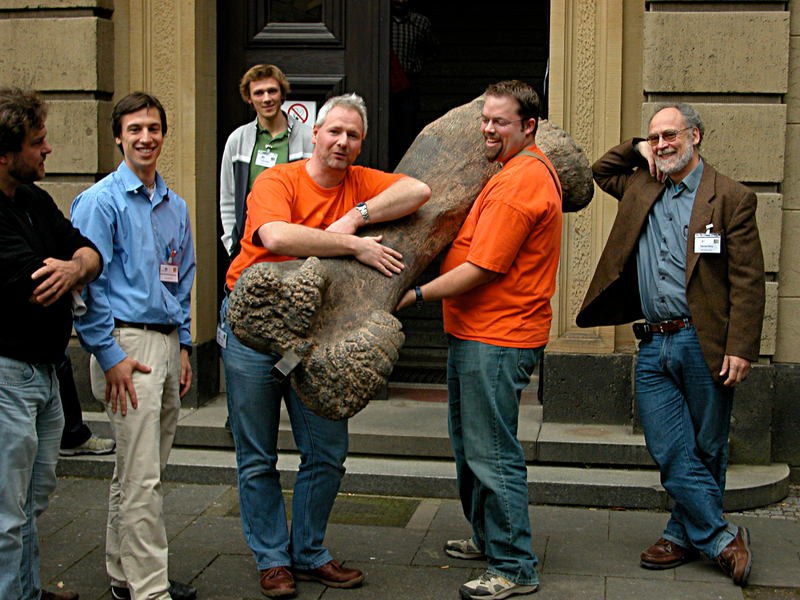 The best part of the workshop was talking to all of the people there who don’t work on sauropods primarily or at all, like nutritionist Peter Van Soest, ecologist Brian McNab, and physiologists Roger Seymour and Steve Perry (Seymour and Perry have both written important papers on sauropods, but those are tiny parts of their much broader research programs). 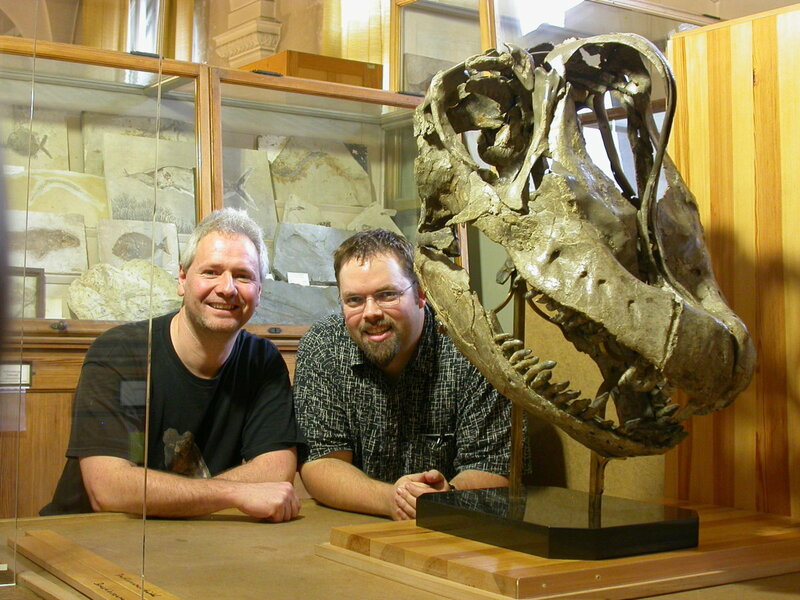 These folks were genuinely interested in the problems of sauropod paleobiology, and they brought tons of experience and data from living animals that really grounded all of our discussions. Most of this stuff is in the literature and its not like paleontologists have completely ignored it, but there is a big difference between knowing that a paper exists somewhere and having the person who wrote it explain exactly what they’ve found and why it matters. The field trip was great not only for the places we visited, but also to have three days to ride around with a busload of sauropodologists–some newly minted–and talk about all of the stuff that came up during the conference. And then Berlin was…well, we took lots of pictures, so I’ll let them do the talking. The overall effect of the trip was to pour a few tankers worth of gasoline on our intellectual fires (well, mine anyway–Mike got petrol). I went with a blank notebook and came home with enough ideas and measurements to keep me going for a long, long time. Mike and I took more than 1500 digital photos between us, and we’ll be mining those for data and for figures for the rest of our careers. However big you think Brachiosaurus is, it’s bigger in person. I promise. You’ll recognize cervical 8 of the HM SII mounted skeleton from several of our tutorials. The best thing about the trip was that we learned so much and had such a good time doing it. Often in academia we talk about an institution achieving a critical mass of workers in a particular field. It’s an apt metaphor–when you get a bunch of people together who share a common interest, the effect is more than additive. That’s even true if you just put two people together. I’ve been on loads of museum visits, many solo, and the research trips I’ve taken with Mike have been more than doubly productive. Two sets of eyes will notice a lot more than one, and two brains can attack a problem from many more angles. Now that I’ve gotten the damned dissertation out of the way, it may be a while before I write another single-authored paper. Cuz, why? Holy crap, all of your Brachiosaurus pictures have really managed to emphasize its sheer enormosity! Are you guys able to discuss the presentations, or is there an irritating embargo in place? Holy crap, all of your Brachiosaurus pictures have really managed to emphasize its sheer enormosity! Dude, I KNOW! I’m no chump, I’ve been working on big sauropods for a while now, but the Humbolt museum has immense Brachiosaurus bits stuffed in hallways and alcoves and in galleries of Paleozoic critters and marine reptiles, so that it’s hard to walk more than 50 feet without bumping into another bone that is just ridiculously huge. It really is an embarrassment of riches. Are you guys able to discuss the presentations, or is there an irritating embargo in place? No embargo that I know of. Most of the stuff wasn’t even new, and much of it has been published for ages. What was novel was bringing so much information from so many different fields to bear on the problem of how sauropods made a living. It was like banging rocks together and watching the sparks fly. We’ll probably discuss some of this at some point. If we’re being maddeningly vague, it’s because we were inspired to start work on a few more papers, and those need to stay Top Secret for a while. So if we put you a diet of Pretty Picture Posts for a while, be grateful that this blog isn’t about something else (say, mammals) where you might lose interest entirely. Darn! That first photo of the B. brancai skull is jarring. It looks like someone punched the rostrum really hard from above. Is that thought to be distortion? I’m trying to get my mind around the expression people there who don’t work on sauropods. You don’t seem to be using it in a hypothetical or counterfactual sense. What in the world could such people work on, instead? Or is it that they don’t actually work on anything, but wish they could? 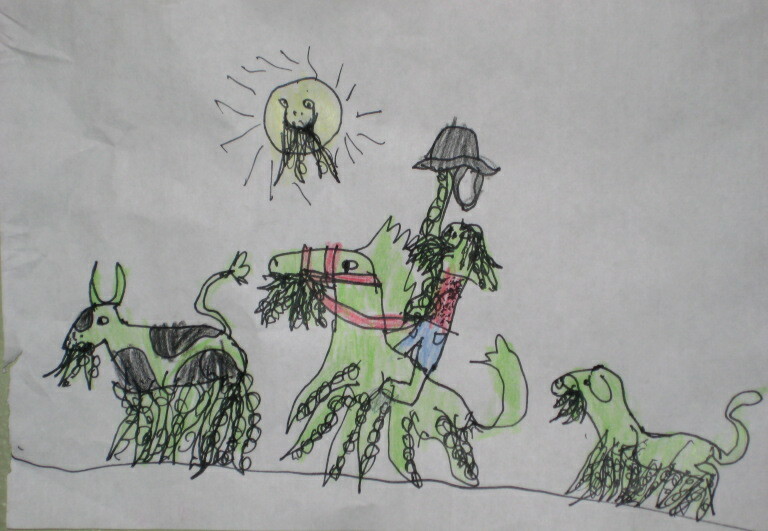 Or that they ride on sauropods, or dine on sauropods, or riff on sauropods, or stub their toes on sauropods? Hm. Matt, you have not yet responded to my query about the radius connected to and restricting access to the ulnar condyle of the humerus by the ulna. The photo with you and Mike in front of the forelimbs even more clearly demonstrates this disconformity. You and I have discussed arm articulation since your manus resolution paper on Apatosaurus, but I’m curious here how Remes avoided dealing with it. Nope, it’s pretty certainly real. If anything, it’s maybe not depressed enough; there is a weird bulge across the midpart of the face, right at the front end of the bony nostrils, that looks like it might be the result of the rostrum not quite hooking up right with the rest of the skull. The skull is mostly complete but there are some veins of plaster running through it. Also, the bone is surprisingly thin; like the vertebrae, the skull gives the illusion of solidity but it mostly a collection of holes and cavities loosely defined by thin strips of bone. Those depressions are narial fossae associated with the bony nostrils. 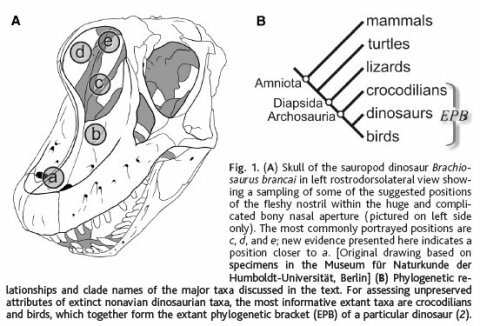 Larry Witmer had a paper in Science a few years ago on nostril position in diapsids (get it free here), and showed that the fleshy nostrils of all diapsids are set at the rostral end of the narial foramina, or narial fossae if the latter are present (I updated the post with Fig. 1 from the paper, which shows the predicted nostril position in that very skull). If you buy that argument, and I find it pretty compelling, then the fleshy nostrils of brachiosaurids were right down at the front of the snout. Same goes for diplodocids and hadrosaurs, and several paleoartists have picked up on this and started reconstructing their critters that way. This may seem counterintuitive, especially for animals with elevated and retracted bony nares, but it’s maybe not as weird as it sounds at first. Loads of mammals have fleshy nostrils way out in front of their bony nares and nobody blinks at that. For my money, the big enclosed space probably housed some kind of heat and moisture exchanger functionally similar to mammalian turbinates, or possibly even actual turbinates incarnated in soft tissues rather than in bone. I’m fairly certain you have me confused with another Matt–possibly Matt Bonnan? I’ve never written a word about the manus of Apatosaurus. The B. brancai remount does seem to follow Bonnan’s hypothesis about how the forelimb articulated. Some find his arguments convincing and others don’t; I don’t have a dog in that fight. This seems like a fine time to ask this question: How do you guys think sauropod external nares should be reconstructed? We’ve all seen Luis Rey’s weird pink fleshy tube nostrils coming down the head, but that’s never looked right to me. Should we give sauropods fleshy external nares like mammals, complete with cartilage structures? As somebody who is often puzzled by how to complete his sauropod head drawings, this is an important consideration. I vote that we adopt “We’ve all seen Luis Rey’s weird pink fleshy tube nostrils” as the Official Motto of SV-POW!. Do weird pink fleshy tube nostrils now officially qualify, like azhdarchids, as honorary vertebrae? And, do only Luis Rey’s qualify? Finally, would Mrs. Rey describe Luis’s nostrils thusly? Oops, that was a major mistake. My bad. I’ve seen old drawings of Diplodocus with a trunk. Is there any basis to that one? Sadly, no. Animals with trunks tend to have retracted bony nostrils, but not all animals with bony nostrils have trunks. 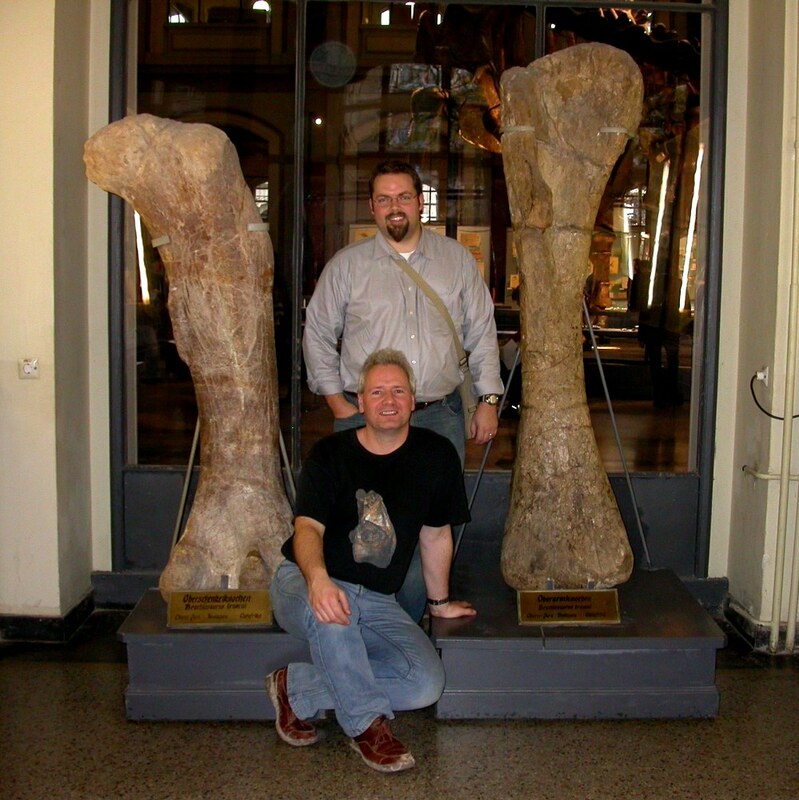 Sauropods have no sign of the muscle attachments or neurovascular support needed for a trunk. I say “sadly” because although I usually have little patience for wacky ideas about sauropods, something in me has always been drawn to trunked sauropods (probably the Imp of the Perverse). In the bowels of the UCMP, in Sam Welles’s library, is a little maquette of Brachiosaurus with a trunk. It’s crazy-awesome, looks like a super-sized reptilian Macrauchenia. It’s clearly just one copy from a production run, but I’ve never seen or even heard of another one like it. Pink fleshy tube nostrils? …oh, these. I thought the trunk theory was just an attempt to find some exc^Hplanation for the weird nostril placement. But I suppose it cut off its nose to lighten its face. It doesn’t strain credibility to suppose that something that went to such lengths to save weight might decide it didn’t really need nasal bones. By the way, that is one surprisingly huge orbit on B. brancai. Now I understand why people keep suggesting they were nocturnal. Why couldn’t they be both diurnal and nocturnal? An animal that big might well be eating more than just 12-16 hours a day. I’ll draw a trunk-nosed Brachiosaurus for you, Matt. All I got you are more pictures of sauropods. I just had a weird thought. Suppose Brachiosaurus did have a trunk. Not some little tapir thing either, but a big elephant-style trunk. You’d have one tube of muscle (the neck) merging into another tube of muscle (the trunk), with maybe not very much to mark the transition. It would look as if someone had arbitrarily hung eyes and a mouth about a meter back from the front end of a 10-meter trunk that started at the shoulders. This is how people get to be cranks–they find ideas that are so cool that evidence can’t be allowed to intervene. No wonder my question about Nigersaurus’s big orbits didn’t attract an answer: everybody is equally mystified. Crankiness doesn’t need intervening evidence. There are more than enough insanely cool ideas with no evidence for or against. (A few of these end up true.) The best are those for which, like Nessie, no evidence either way ever will surface, but could in principle. My current favorite is Sentient Maastrichtians diverting an asteroid with tragically educational results — historical giant boneless aquatic pterosaurs, defensive sauropod cranial detonation, and Azhdarchid ninjas notwithstanding. But it’s polite to attribute the crankiness to the idea, not the originator. But why just one trunk, and not the full complement of tentacles? Weird nostril placement, hmm. Maybe it was to prevent spiky plants from getting into the (presumably softer) insides of its nostrils. Is anything known about the relative spikiness of Late Jurassic plants vs. our own? Probably sauropods were munching on lots of Araucaria and pines and such. What I want to know is how they lubricated their very long esophaguses. They must have drooled like hydrants, which is a funny image since it is usually the theropods that are shown dripping saliva all over the place. We could have snood-like nostrils, hanging down on either side, staying out of trouble. 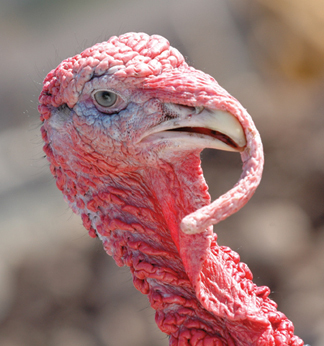 It would be tempting to immusculate them, but I suppose turkeys would have got there too, by now, if they could manage it. Maybe they had weird mucus membranes as well? Or extra saliva glands in the esophagus? Saliva? I say internal tentacles to drag the stuff down, like the the graboids had in the movie “Tremors”. These don’t need to reach much beyond the top of the throat (except for the sake of dramatic movie scenes, of course), but they have a long way to go worming up and down that throat. No, I’m not feeling especially cranky today, thanks for asking. Could the insides of their esophaguses have been leathery and not lubricated? It seems strange, but I don’t see why a tough esophagus would harm digestion. Wouldn’t that be rather prone to… clogging? (Ever tried to domestic-vacuum-cleaner-up a whole load of dry spiny fibrous stuff? The experience is educational). As to swallowing all that way, I reckon saliva-stodged bolus plus oesophageal peristalsis plus gravity might do it. But for horizontal or downward-sloping neck orientation, that would be saliva+peristalsis alone I guess. (And an occasional long… very long… ;-D … drink). Weird you should have said that. Before reading it I had already imagined twinned party-blower-style inflatable probosces, retracting onto the depressed rostrum when deflated, but when inflated (by a mighty breath) extending (dorso)laterally for some considerable distance. Think Arsinoitherium, or Brontotherium (apologies for mentioning stinkin’ mammals). A combined visual and aural signal! If the probosces were fluorescent-coloured (Luis Rey, how perceptive of you!) or even luminescent (for nocturnal use), all the better. Sauropods in Christmas Party Mood! Hah, nice trunk ideas…. though to me the trunk always looked EXTREMELY freaky and pointless. Who needs a trunk when you already have super-tall shoulders supporting that huge neck? Regardless of which way the skull was squashed – up or down – it does look distorted. The tip of the snout is very narrow (the two halves look folded up against each other) and the area under the nostrils looks too wide (so does the lower jaw…) though we should be grateful that a Brachiosaurus skull was preserved at all, considering its delicate structure. The fossae that Larry Witmer wrote about – they seem like anchoring points for the nasal organ, but on the other hand, flesh is usually anchored to projections, not holes. My guess is (since no other sauropods are known to have this, lets go overboard) that the fossae housed some sort of infrared-sensing pits like on pit vipers. This guy would have to watch out for all those stinkin’ mammals living in the treetops – also any small pterosaurs that nested in trees. My guess is, sauropods didn’t like it when they munched on these critters by accident. But diplodocids and camarasaurs didn’t have the height of Brachiosaurus, and in all likelihood, any tree-dwelling mammals tried to get as high as possible above predators on the ground. Plus, Brachiosaurus had a much wider snout and stronger teeth than Diplodocus, and I think it probably wasn’t as picky about where it aimed its chompers – so the end result is some nasty Jurassic arboreal roadkill! Hence, Brachio’s heat pits would detect the mammals and it could avoid this stinkin’ snack. Of course they would also be useful for detecting big predators in the distance whenever the Brachiosaurus was taller than the trees. Considering they probably generated a lot of body heat from the fermentation of their food in that huge gut and the retention of their body heat because of their huge mass, maybe eating in the cooler parts of the day and into night made sense.